GIANT SALE!!! ACT NOW! WAS $6,925.00 NOW $6,659.00. AutoWeek calls Accord tried and true. Named an AMI Auto World Best Used Car. Named on the Car and Driver 2004 Ten Best List. Named a Consumer Guide Best Buy for 2003 & 2004. Awarded AAA & Parents Magazine's 2004 Best Sedan for Families. Winner of the 2003 AAA Auto Guide 2003 Award for Cars $15,000-$20,000. 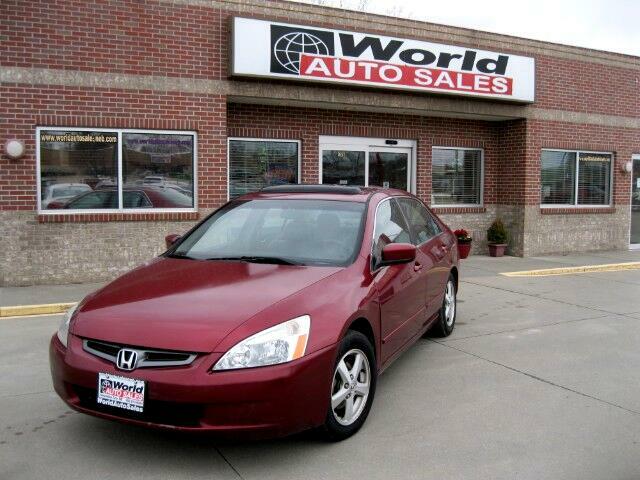 Road & Track Buyer's Guide 2005 ranks Accord among the best cars in the marketplace today. Named on the IntelliChoice 2005 Top Ten Lowest Cost of Ownership List. Sedan perfection according to Car and Driver. 6-Disc In-Dash Compact Disc Changer, 6 Speaker Sound System, Cruise Control, Heated Front Seats, Leather Upholstery, Power Door Locks, Power Windows w/Driver's Side Auto-Up/Down, Power Moonroof w/Tilt, Remote Keyless Entry System, Side-Impact Door Beams, and many more features. Stop by today for a test drive!!! Call or text (402) 873-6925 for quick answers to your questions about this vehicle. Your message will always be answered by a real human — never an automated system. We pride ourselves in the company we keep; OUR CUSTOMERS, we have so many loyal repeat customers, and we thank each one. We are proud to say that World Auto Sales is the Nebraska Independent Auto Dealers Association Quality Dealer of the Year 2017. Offering excellent, fast, financing, extended vehicle protection plans, GAP coverage, accessories and much more. Our vehicles are carefully inspected and have free Auto Check Reports. Vehicles are priced to the market which means you will always have a fair price. We make every effort to offer only top-notch pre-owned vehicles at market-driven prices. All vehicles subject to prior sale. Actual fuel economy rating will vary with options, driving conditions, habits and vehicle condition. Please verify all details, including options, miles, and actual price, for accuracy prior to purchase. Safety Recall Information. Some vehicles may be subject to manufacturer safety recalls. See if there are any open safety recalls for this vehicle. This does not include non-safety recalls. Recently announced safety recalls may not yet be posted and there may be a delay between the time a repair is made and before it is reported or posted to the website. Before purchasing, be sure to ask the dealer for an up-to-date status on any recalls. Message: Thought you might be interested in this 2005 Honda Accord.